Jean travaille dans le club. - Il travaille dans le club. Jean works in the club. - He works in the club. Le stylo est sur la table. - Il est sur la table. The pen is on the table. - It is on the table. La fleur est jolie. - Elle est jolie. The flower is pretty. - It is pretty. Jean et Paul vont au cinéma. - Ils vont au cinéma. Jean and Paul are going to the cinema. - They are going to the cinema. Les fleurs sont jolies. - Elles sont jolies. The flowers are pretty. - They are pretty. Grammar note: Pronouns are general words that replace specific nouns in sentences. A verb has a subject (the person or thing doing the verb), and may have an object (the thing being done to). Subject pronouns are usually different to object pronouns, so you cannot use one to replace the other (in English it can be either, but French uses distinct words) . 4.I can't remember the last answer offhand but it does have an instance where it COULD be correct. The point is that other than answer 1 the other options are ALL options and may all be correct in certain circumstances. The ONLY certain answer to this particular question is the first one, all others are possible but are liable to return a partially correct result depending upon the way in which the question is viewed. I submit that it may NOT be the best question for this exercise. Only a) and b) are possible because "Il" means "he"/"it". It cannot mean "She" or "They". Question 1 has two possible answers. If so, how can I distinguish ‘il’ is Tom Cruis or the movie? What does this relate to Jinju? The film was showing in the new theater. It was great! How do you know what "it" refers to, the film or the theater. If the question was referring to not only the movie, as I felt it was, then the 2nd answer offered should have been, « Tom Cruise, il est... ». Could you also say "C'est tres bon?" Instead of "Il est tres bon?" Yes, "c'est très bon" is perfectly OK but it is a more general statement. "Il est très bon" refers to a specific subject. Could you give some context to your query as 'il est très bon' is often used incorrectly for 'c'est très bon'? I answered - Marc is watching the film. It is very good. I was marked NEARLY correct because I didn’t include the answer: Marc is watching the film. HE is very good. That doesn’t feel like a correct answer to me. Well, in french you can't tell what the pronoun "il" refers to: it could either be the film or marc. So both translations are -- barring any contextual information on top -- indistinguishable in French. -- Chris (not a native speaker). Yes, I know what you are saying. Just think of a situation where a kid is to watch a boring educational film and he does so voluntarily. He is such a good boy! ;) -- Chris. Thanks for the good answer Chris! I had the same issue as G on this question. I agree that this answer could be also correct, but the most logical one, if one has to pick one, is that the movie is good. If the answer can be either one, then this question should be changed to ask for all the correct answers instead of one correct answer. Why is it ‘Ils brûlent tout’ not ‘Ils sont brûlent tout’? "Ils brûlent tout" translates to "They burn everything".This is one of the few cases where you can literally translate every word and get the right answer. Not many of those around ;) I am not sure why you would want to stick "sont" into the sentence. What exactly did you want to say? -- Chris. Thanks Claus, I agree with you and understand your explanation but the quiz question was to translate “They’re burning everything” hence I put sont in there for “are”, which was marked as being wrong. When you conjugate a verb in the present tense, it already means "is / are -ing." For example, "Ils parlent" may be translated as "They are speaking," or "they speak." Bonjour Kev, There is a lesson here that addresses this topic exactly; however, I am unable to locate it but basically is says that in French unlike in English there is not a separate conjugation to say I am speaking, like in Megan's examples above. «Il parle» translates to «He speaks» OR «He is speaking». Claus gave a great example about the phrase in question by stating that there are not many times when the phrase in French can be translated word-for-word to English. I had a French instructor and her favorite phrase to the class when we attempted to translate was this: French is not simply English translated to French. There are too many syntax variables between the two for that to occur. Learning French is a totally different way of thinking about language. How do you say "Jeanne eats from the ice cream" in French? Bonjour Susan ! No, as here it is not a general statement but rather a specific statement on that specific flower, hence "elle". Moreover, "c'est jolie" is incorrect as "c'est" is also followed by the masculine form of the adjective. It would be "c'est joli". 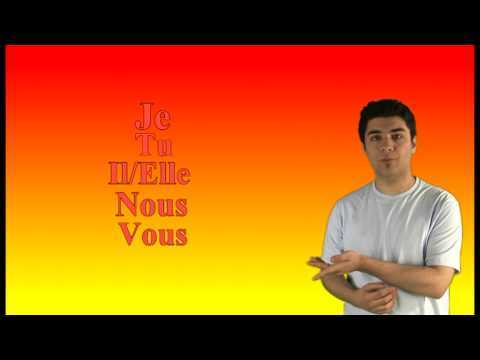 See also: https://french.kwiziq.com/my-languages/french/view/3006 I hope that's helpful! À bientôt ! Bonjour Aurélie, Merci. Yes, helpful. À bientôt, s.
how can i learn that lunettes is plural? is there a singular word for lunettes? Lunettes is just like "eyeglasses" in English - they are both plural. The "s" at the end usually means that the word is plural, but there are exceptions. There are many words like this in both languages. Sometimes they're both plural and sometimes the noun is plural in one language but not the other, such as les épinards = "spinach." This is just something you need to learn along with the new words. Dear Lea, You can hardly ever 'guess' the gender of a word unfortunately... however, in that case, you can remember that ALL words ending in '-ette' are feminine in French, so here you are. For other gender tips, have a look at this lesson: https://www.french-test.com/revision/grammar/how-to-identify-gender-by-some-word-endings I hope it's helpful!